While I am sure that worry is something that will only disappear once I am with Jesus I want to try and learn to get rid of worry as much as possible. So this is Part 1 of a mini series on worry. It would be interesting to know how much time I have wasted worrying. I remember flying in an airplane when I was very young worrying about hijackers and wondering if I could fit under the seat in front of me. When we lived in Africa I wasn’t allowed to go anywhere alone. If I wanted to see my friend, a guard would take me and I would worry about our safety. When I was a teenager my dad was diagnosed with terminal cancer. I worried a lot during that time and during the time after his death. It didn't do any good and it certainly didn't save him. I worry about whether the decisions I make are the right ones, though I can't go back in time and change anything. I worry that I am not portraying the beauty of Jesus to my kids. I worry about small things like medical bills and big things like the salvation of my children. We all worry, but do we know why this is a sin? The King of Kings and Lord of Lords has adopted us as his children and we are able to call him “father.” He has promised us an inheritance that is so grand that we can’t fully understand it. Our father promises to care for us, to love us unconditionally, and to vindicate wrongs done against us. He promises to forgive us of all sins. Do we really believe this? Because if we do we, of all people, have no reason to worry. Answer: That I am not my own, but belong - body and soul, in life and in death - to my faithful savior Jesus Christ. Do we believe that he is faithful? Is our faith in our Savior or in our circumstances and actions? Worse than merely doubting God we also call God a liar when we worry. God has told us that though this life won’t be easy, he will be with us and for us. He has promised that all things work together for the good for those who love Him. He has promised to take care of us and guide, to give us wisdom and comfort. 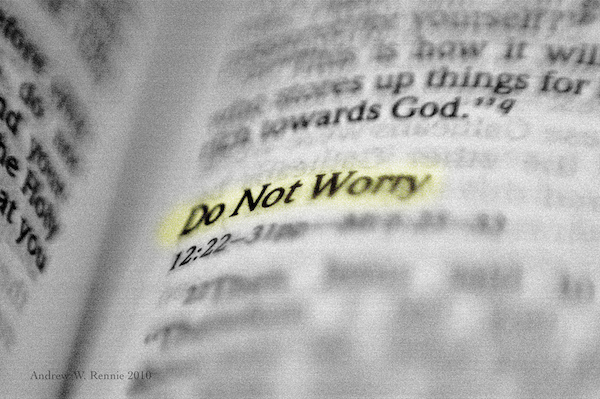 When we worry we are telling God that his word, that his promises, are not true. Twice in Matthew 6 Jesus tells us directly not to worry and yet it seems like no matter how many times we have read those verses we worry anyway. Worry is a form of disobedience. Life may seem complicated and messy, our circumstances may seem tangled and chaotic. Life may even seems scary but worry is not the answer. We are never given an exception in this. Our living God knows all the adverse affects worry has on us. He knows that it will take away our joy, rob us of sleep, mess with our minds so that we end up looking for answers elsewhere. Worry takes away our strength and makes us think about things that are not lovely or true or right. Instead of wasting the time that God has given us with worry, instead of spending nights tossing and turning because we are anxious, we are called to “seek first the kingdom of God and His righteousness” and God will take care of everything else.